When you are at home, you should feel a sense of relief. Relaxation. Refuge. 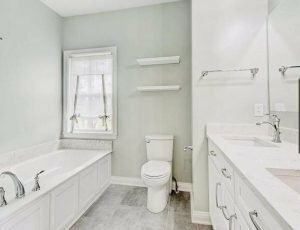 A sense of “Ahhh…” For Robin and Matt Taylor, their house was indeed a point of pride — but their master bathroom was not as welcoming or as serene as they wished. With guidance from the ACo team, they embarked on master bathroom remodeling journey. As Robin says, the bathroom was “nice.” (Imagine the least amount of enthusiasm possible as she uttered that word!) The construction grade materials were perfectly serviceable, but it lacked the soothing energy and light that the couple wanted. The bathroom was “nice.” It was fine. It was functional. But the Taylors wanted more. They wanted to truly love where they live. What’s the first step of a project? Scouring Pinterest for ideas? That’s a good place to start! But when it comes to a successful remodel, setting your budget is a must. This will help guide your decisions. Need help? Use our handy budget calculator. With the right numbers in mind, the Taylors’ project proceeded. Robin envisioned a clean, bright spa-like atmosphere; she had the idea of where she wanted to be but didn’t know how to get there. Fortunately, ACo designer extraordinaire Dani Kohl grasped the dream and helped to make it a reality. To achieve the Taylor’s goals, Dani incorporated clean, streamlined surfaces, a subtle yet bright and cheery color palette, and an eye-catching shower niche with coin tiles for contrast and depth. 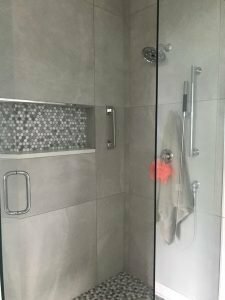 Project manager Roger Needler admits the tiles were a challenge, but they “add a great element,” and the job was accomplished thanks to Roger’s meticulous eye and experienced installers. No detail was too small to consider: the shower faucet, for example, is both horizontally and vertically centered. The glass door gleams, allowing in elegant light. 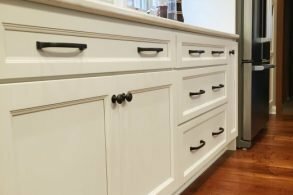 The hardware, faucets, and drawer pulls are sleek and a perfect complement to the convenient and attractive double-sink vanity. Each element works beautifully together. Matt remembers that when Roger was issuing instructions, he’d say, “I want it this way. I want it that way.” He took on a sense of ownership for the project, ensuring that every component, down to every last tile, was perfect. 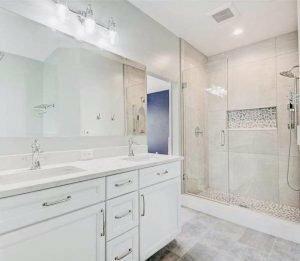 He poured the same effort and exacting care into the master bath as he would have if it had been his home. This allowed Matt and Robin to feel at ease. They didn’t need to interrupt their lives to micromanage; they trusted Roger to do the job right. When you trust your remodeling team, you eliminate untold stress, hassles, and headaches. You can love where you live — even when you’re in the middle of a project! Watch this video to hear the Taylor’s story, and see for yourself their bathroom’s gorgeous transformation! ACo’s Dani and Roger take exceptional pride in their work, and they are just as happy with the results as Matt and Robin. The joy they take when clients are satisfied, when expectations are surpassed, ensures they put in 100% on every project. Do you love where you live as much as the Taylor’s? Take our quiz to find out!